“When people die, especially in such unfortunate circumstances,” President Vladimir Putin said at a Kremlin press conference on Tuesday afternoon, “it is always a tragedy”. The president was responding to the destruction of a Russian reconnaissance aircraft and the deaths of fifteen crew members during an Israeli Air Force attack on Syria on Monday evening. The Israeli operation was coordinated with British and French commands to spoof, confuse and overwhelm Russian and Syrian air defences. What will be seen by everyone has already been registered. 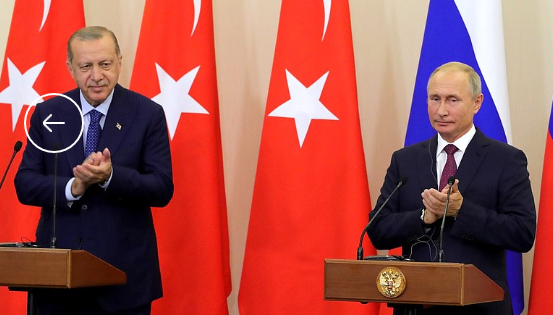 According to Turkey, Putin has conceded Turkish military occupation of the Idlib governorate of northwest Syria, allowing Turkish Army reinforcements from the west and north, but preventing Syrian Army operations in defence of Syrian territory. According to Israel, Putin has accepted the Israel Defence Force’s (IDF) air superiority over central as well as southern Syria and a free-fire zone for any target in Syria which Israel regards as hostile, including Russian military operations. According to the Russian military command, Putin has forfeited his defence of Russian forces in Syria to the combination of Israel, France and the UK, which coordinated the combat against Syria on Monday evening. 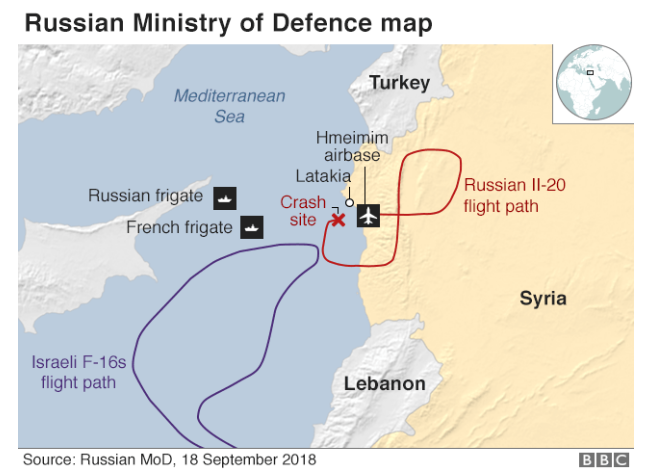 Source: https://sputniknews.com/ The red line shows the flight path of the Russian Ilyushin-20 from take-off at the Khmeimim air base at 2031 until, shortly before landing at base, it was hit by a Syrian missile at 2207. The red X marks the location of the downing at sea. The dotted blue line shows the flight path of four Israeli F-16s between 2200 and 2210. The blue vessel is the French Navy frigate Auvergne. The red vessel on the map is the Russian Navy frigate Pitlivy. Source: BBC. Missing from the Russian map and the BBC translation and commentary are the two British Air Force planes reported in Israel to have taken off from the Akrotiri airbase in Cyprus, and to have maintained a holding pattern above the flight path of the Israeli F-16 fighter-bombers as they moved into their firing positions. 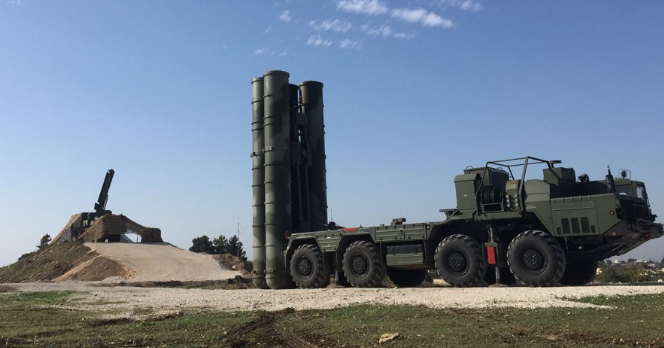 The S-400 at Khmeimim airbase. For details of the S-400 system’s capabilities for simultaneous tracking and multiple targeting, as well as range, read this. 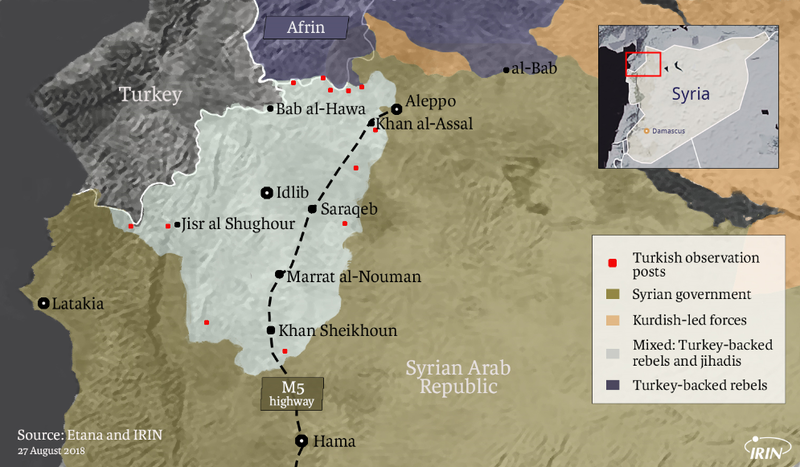 The targets struck by the IDF on Monday night were all within 50 kilometres of Khmeimim. 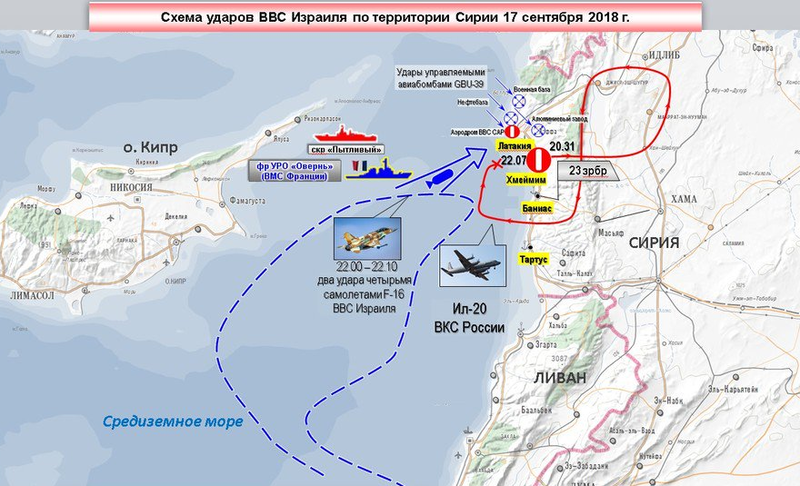 Israeli reporting noted “the attack near Latakia is especially unusual because the port city is located near a Russian military base, the Khmeimim Air Force base”. Prime Minister Netanyahu and President Putin at their last Kremlin meeting, July 11, 2018. For details, click. 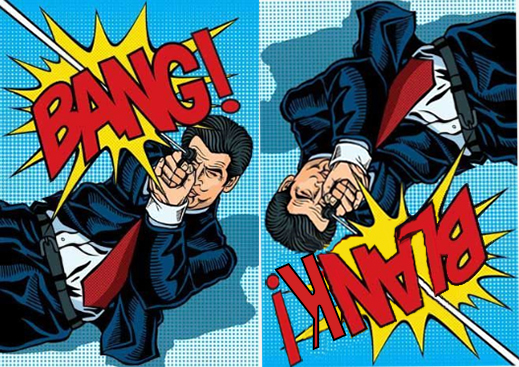 The last four words misrepresented what had been happening in Moscow. 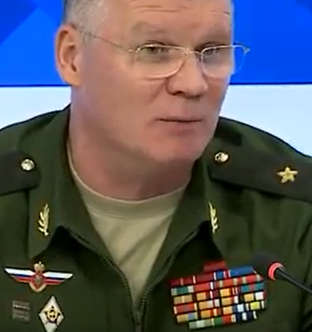 Unlike the last fatal aircraft incident at Khmeimim in March of this year, Putin avoided making public his contact with Shoigu, if there was one. Following the crash of an An-26 Antonov troop transport, the Kremlin record claimed at the time: “during a telephone conversation with Defence Minister Sergei Shoigu Vladimir Putin received the latest information on the crash of a Russian An-26 military transport aircraft in the Syrian Arab Republic… The head of state expressed his deepest condolences to the families of the victims and to the entire staff of the Defence Ministry on the loss of their comrades.” In that incident, 39 on board were killed, including a major general. The Defence Ministry investigation concluded that wind shear as the aircraft was landing had accidentally caused the crash. In March Putin publicized his agreement with Shoigu on wind shear; on Tuesday he kept secret his refusal to agree with Shoigu on Israel.